I love planning and creating meals for my family. This endless set of tasks bring me great joy. Meals are usually in the back of my mind throughout the week. Still, there are times when I find myself hurried and not as prepared as I like to be. Monday night, for example, I got so involved in researching a new project—setting up Pinterest boards for a client—that I lost track of time. When I looked up from my computer it was 6 o’clock. My husband and daughter would be home shortly, hungry, and I hadn’t been to the store that day nor had I considered what to prepare for dinner. After a moment of panic, creativity took hold. What are some of your favorite last-minute meals? Have a great Valentine’s Day. May it be filled with love. Note: Please watch for my next post during the first week of March. Heat the olive oil in a large skillet that is wide enough to hold all the ingredients, including the cooked pasta. Fill a large pasta pot with water and bring to a boil. Add the garlic to the hot oil. Stir. Add the chicken strips and shrimp. Stir in to coat with the olive oil and garlic mixture. Continue stirring until the meat is cooked through. The chicken should be golden, the shrimp pink on the outside and opaque, when done. This should take about 5 minutes. 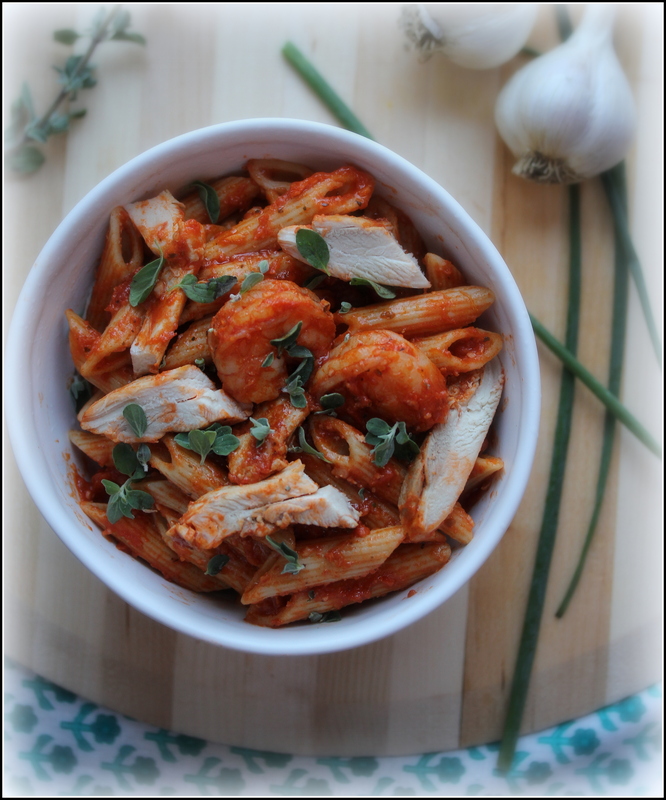 Add the prepared tomato sauce to the pan, stir it with the cooked chicken and shrimp. Bring to a simmer. Add the pasta to the boiling water, stir, bring the water to a boil again, then lower the heat to a simmer. Cook until the pasta is al dente. Drain. Add the pasta to the prepared sauce and meats. Sprinkle with salt and freshly ground black pepper. Stir to coat completely. Allow the entire dish to simmer 10 to 15 minutes before serving. Divide the pasta between serving bowls. Sprinkle with fresh herbs and Parmesan cheese, if you like. 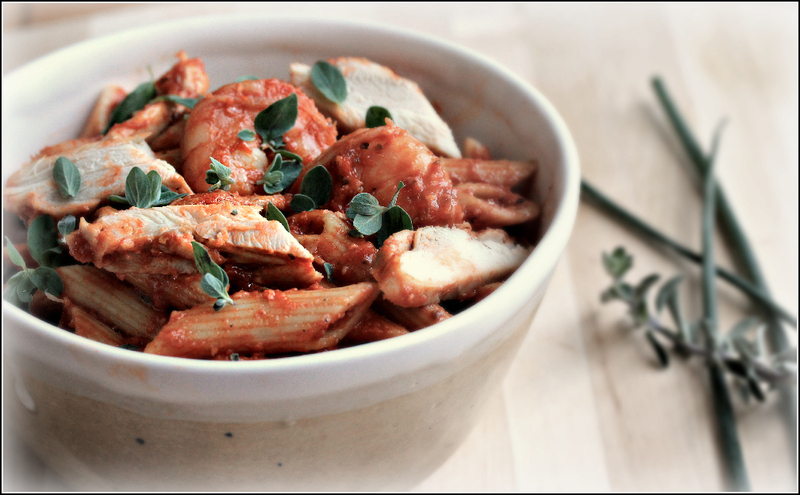 Use your favorite prepared pasta sauce. My preferred brand is Muir organic. Substitute egg or gluten free pasta, if you like. Serve with a Market Morning Salad and Parmesan Muffins or Savory Parmesan Scones.